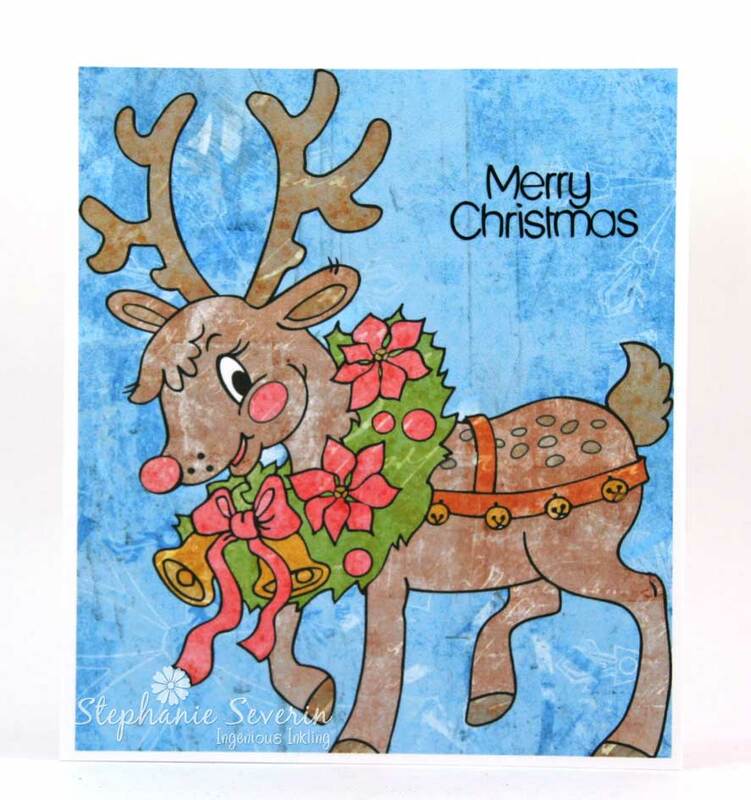 Robyn's Fetish Digital Stamps and More has so many lovely holiday items, there's NO WAY we could choose only one, so here's some additional inspiration for your hybrid card-making pleasure! 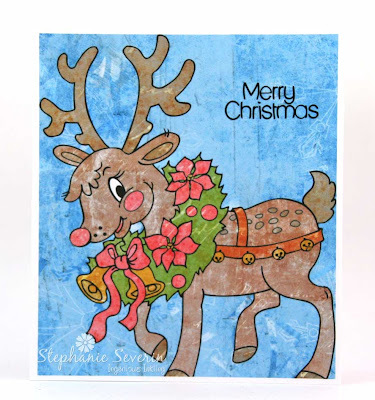 Lauren says, "My favorite thing about digital stamps is that after you've settled on a design you can effortlessly make as many cards as you'd like! 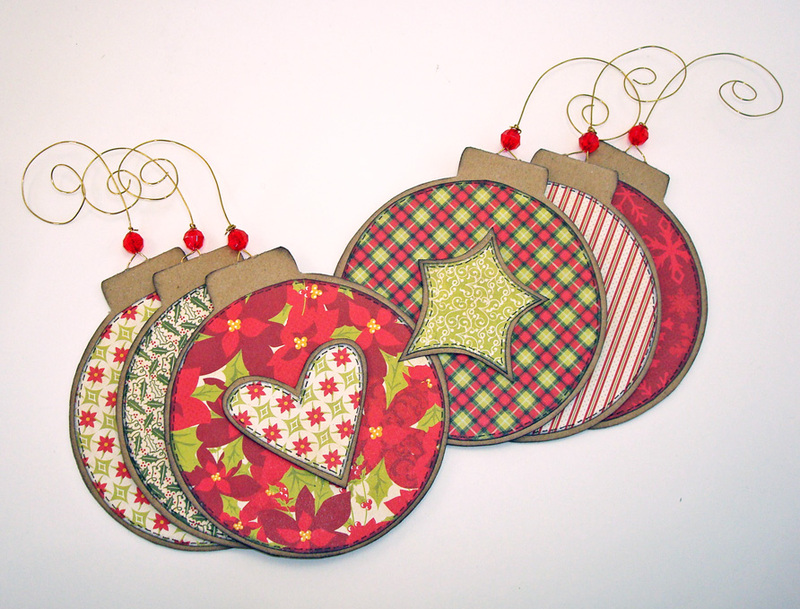 I used the Christmas Ornaments set to create a template for a set of adorable 4" round ornament-shaped cards that will go to my nieces and nephews this December. I used a coordinating paper pad to mix-n-match patterns in order to make cards that were very similar... but each unique! The "real" hanging wires and bead details make them just a little bit more special." Yes, that's right, one lucky random cardmaker who links their newly made, hybrid (or completely digital) holiday card with us this time will get to *CHOOSE* five stamps from the Robyn's Fetish shop! But what if you don't *have* a digital image to use on your card, you ask?! Not to worry, Robyn's Fetish have got you covered--they're providing A Bell for Christmas absolutely free to any ♥JINGLE BELLE♥ who'd like to use it! 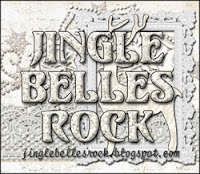 Just email lovely design team coordinator Susan Paulson at susan_paulson@verizon.net and request your free Jingle Belles Digital Image. We're thrilled they're offering another opportunity for everyone to try a digital stamp, so please join us in heartily thanking them! Lauren says, "One of my favorite looks for digital stamps is to old-school paper piece them... but with a techie twist: I print several duplicates of my image--in this case the very elegant Christmas Lamp Post from Robyn's Fetish--on clear ink-jet labels from the office supply store, and then stick them to the papers i'd like to use for each bit of my image. In this way I can use quite teeny scraps of lots of different patterned papers in my design! For this card, I also used the March sketch from The Craft's Meow as a road map, and I love how it came out!" I used two shades of red together with green & gold grungy papers from my digital stash. 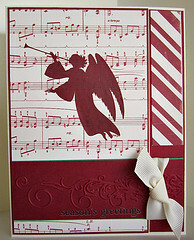 EAD Designs rub-on sentiment to complete my card." 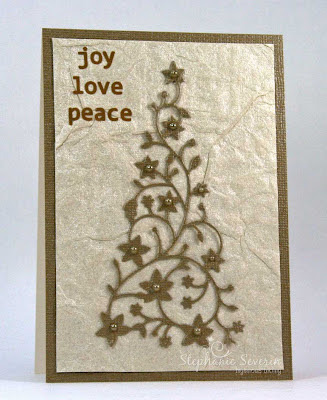 What gorgeous inspired creations you shared with us for our Neutral Noel ... such beauty in neutral tones & classic designs. Here are a few that we felt interpreted the prompt particularly well. incorporated fabulous textures with classic muslin fabric and a corrugated background ... the perfect palette for her rich neutral wreath. created this gorgeous shaped card filled with tone-on-tone texture and gold tipped roses ... such neutral elegance with a tiny pops of color. 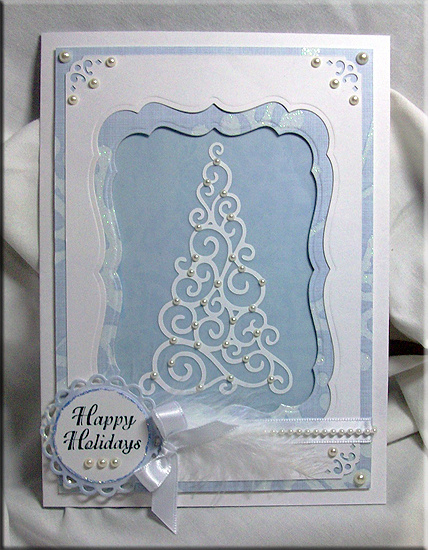 used a border punch to create this fantastic snow-covered holiday tree. The subtle background embossing and perfectly placed snowflakes completed this wonderful neutral design. If you haven't taken time to take a trip through the Neutral Noel gallery and leave a little jingle belle love ... please do. You will most certainly be inspired. Check back at midnight for another great holiday prompt ... and perhaps a wonderful sponsor and prize. 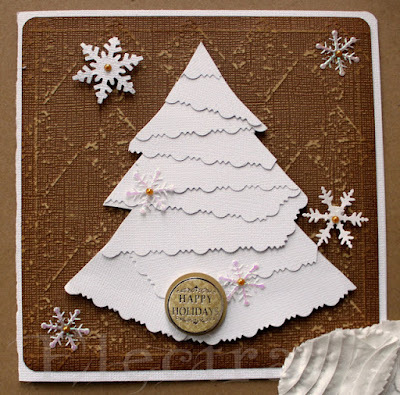 We love what you've been creating inspired by our Neutral Noel inspiration Photo. 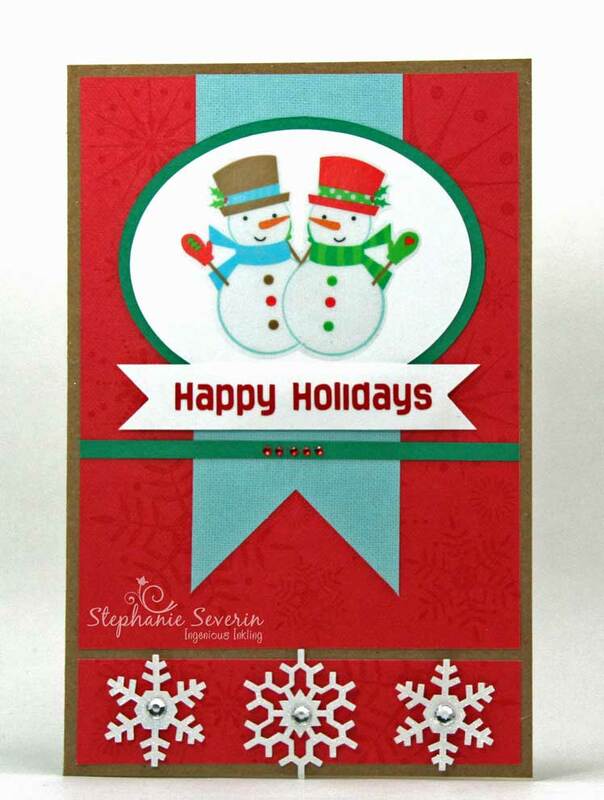 Stephanie says, "My card was inspired by the Christmas tree pillow. I die cut my Flowering Christmas Tree from metallic gold cardstock & decorated it with champagne adhesive pearls. 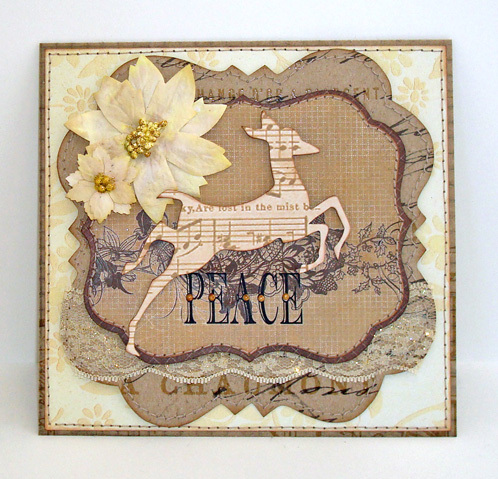 I finished with EAD Designs rub-on sentiments in gold." Lauren Says, "for my second shot at this prompt, i decided to go A LOT more literal: i used the tans and creams from the inspiration photo, a square shape like the pillows have, and lots of "millinery" details like fabric flowers, lace, and loads of machine stitching!" Remember, you should link-up here between now and 6pm (EST) on Wednesday, March 21st. 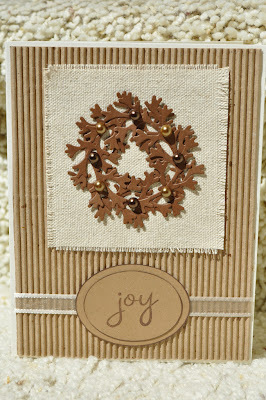 Use keyword JB12-06 for our Flickr & other galleries. 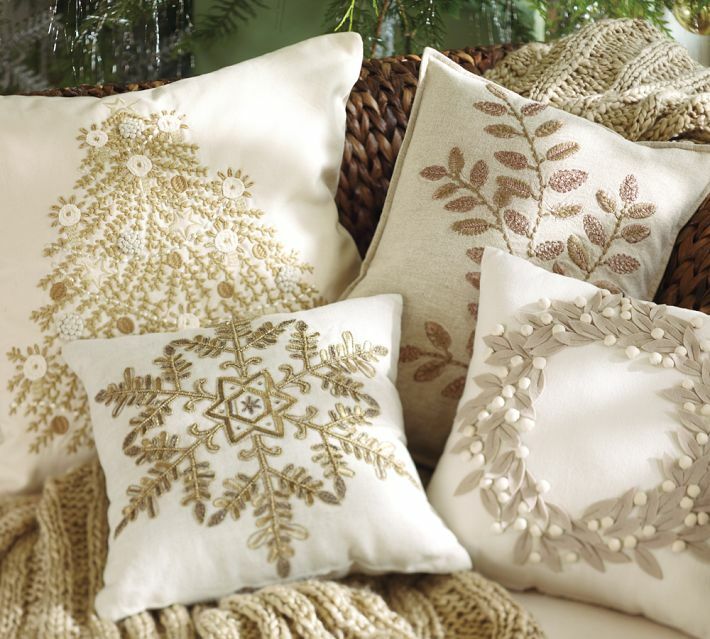 The sixth Jingle Belles prompt of 2012 ~ Neutral Noel ~ is to create a card inspired by these wonderful neutral-toned holiday pillows from Pottery Barn. You might choose the design elements decorating the pillows (leaves, snowflakes, wreaths or holiday trees), the peaceful neutral color palette, the texture of the fabric and felt ... whatever inspires you. We can't wait to see what you create. Lauren says, "i have an aunt whose favorite color is *WHITE*, and every year i try to make her a special card; since we're embracing a neutral palette this week, i thought it'd be a great time to have a go! 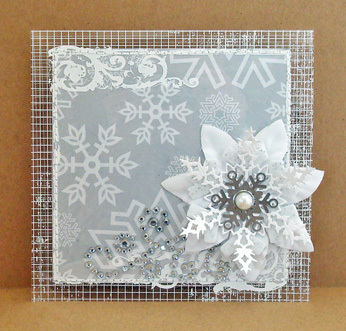 since i really love the pillow in the inspiration photo with the very ornate snowflake, and it seemed like a nice theme for a mostly white card, i chose as many white and grey and silver "snow themed" products as i could find in my stash and mixed them all together... and this is the result!" 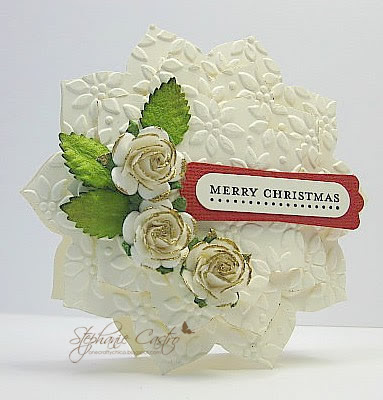 Stephanie says, "I took a more literal approach on the inspiration picture, choosing to recreate the wreath pillow in the bottom right corner using paper. 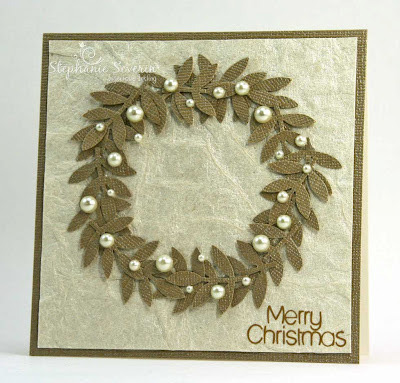 I punched lots of leaves from gold metallic cardstock and attached them to shimmery ivory handmade paper using glue dots. I added three sizes of ivory adhesive pearls and an EAD Designs rub-on sentiment to complete the design." We hope you find our inspiration photo as inspiring as we did ... and can't wait to see what you create. Link-up here between now and 6pm (EST) on Wednesday, March 21st. Use keyword JB12-06 for our Flickr & other galleries. It's hard to believe we're into the month of March, ♥JINGLE BELLES♥, but having all of our lovely friends from EAD Designs with us the last two weeks, and making so many wonderful sticker- and rub-on festooned cards with their generous sponsorship, has totally made the time fly by for us! 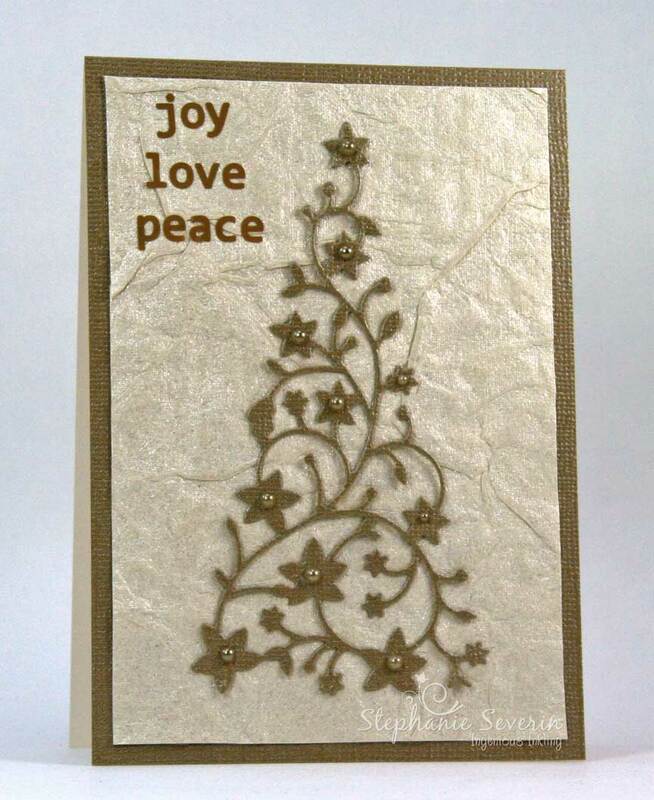 made her own beautiful swirly christmas tree sticker by die-cutting self-adhesive vinyl, then used it as the centerpiece of this stunningly soft and elegant holiday card! used a dramatic red angel rub-on that coordinates magnificently with several bold but understated patterns on this marvellously monochromatic masterpiece! made five (FIVE!) totally diffferent, but equally lovely, cards for this prompt! 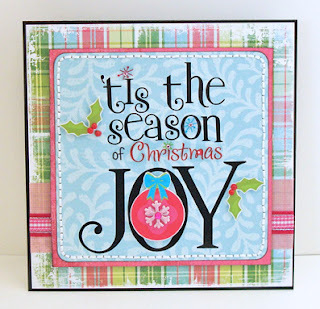 For this one, multiple layers of red and green patterned paper frame a lovely--and tiny--christmas tree sticker to perfection! is the fortunate lady in question! Just a reminder, darlings, that there's almost another whole week to submit your wonderful sticker and rub-on festooned creations for a shot at that amazingly generous $25 gift card to the EAD Designs Shop! 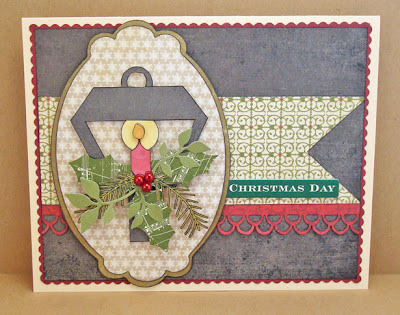 the Christmas Sentiments sheet rounds off this lovely holiday card! 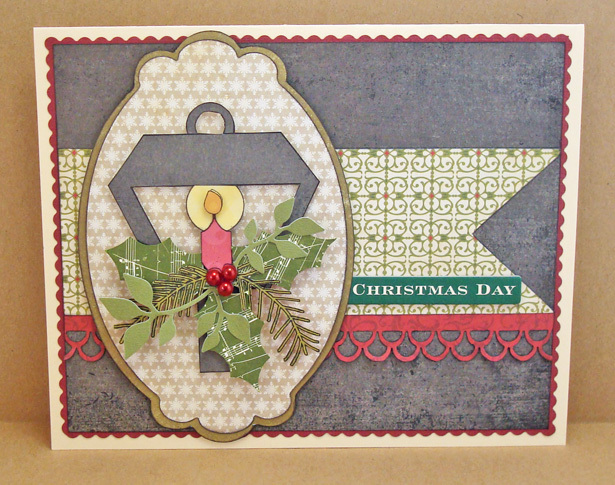 Lauren says, "I built my card around a custom wordart I made using EAD Designs Christmas Sentiments 1 Rub-ons, with a few Retro Christmas and Deck the Halls Stickerz thrown in for good measure. I chose just a few color-coordinated papers and embellishments, tempered with a little bit of black ink and a black card base so the sentiment would really shine! Hand-stitching adds texture and interest... but also... I just really enjoy a little hand-stitching after a long day!!!" Stephanie says, "I also used that adorable little Frosty Friends sticker with a coordinating red rub-on Christmas Sentiment. 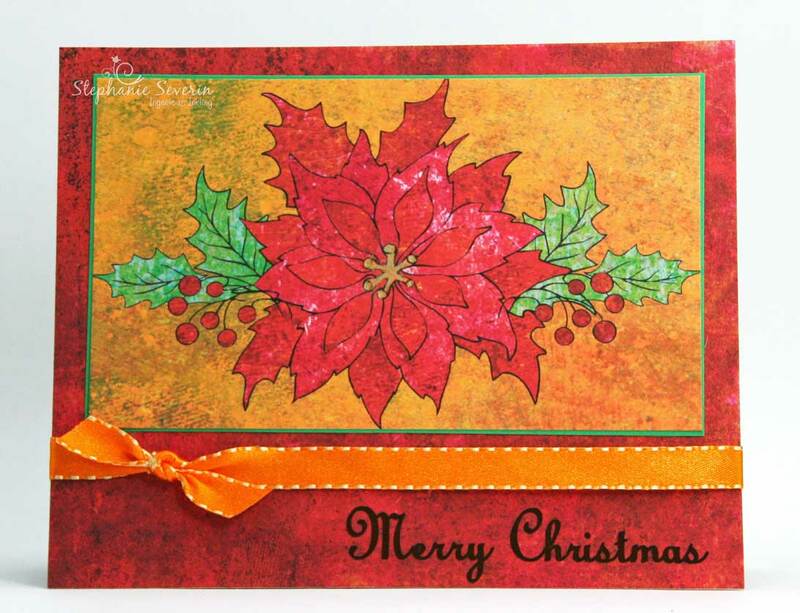 I stamped some subtle red-on-red snowflakes on the background using this week's Deconstructed Sketch." 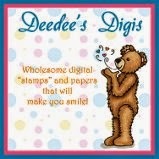 Scroll down for complete information, and to link up your own gorgeous cards!! !